What is the Core Humanitarian Standard on Quality and Accountability and why is it important? All industries have standards to assure the quality of their work. As the humanitarian sector has grown in size and become increasingly professionalised, the number of standards in the sector has increased. Many standards have focused on ensuring that the needs of crisis-affected people, who are vulnerable and often voiceless in humanitarian assistance, drive humanitarian response. Currently, there are an estimated 70 local, regional and global standards that are applied in humanitarian response, leaving time-pressured aid workers struggling to meet sometimes contradictory demands. 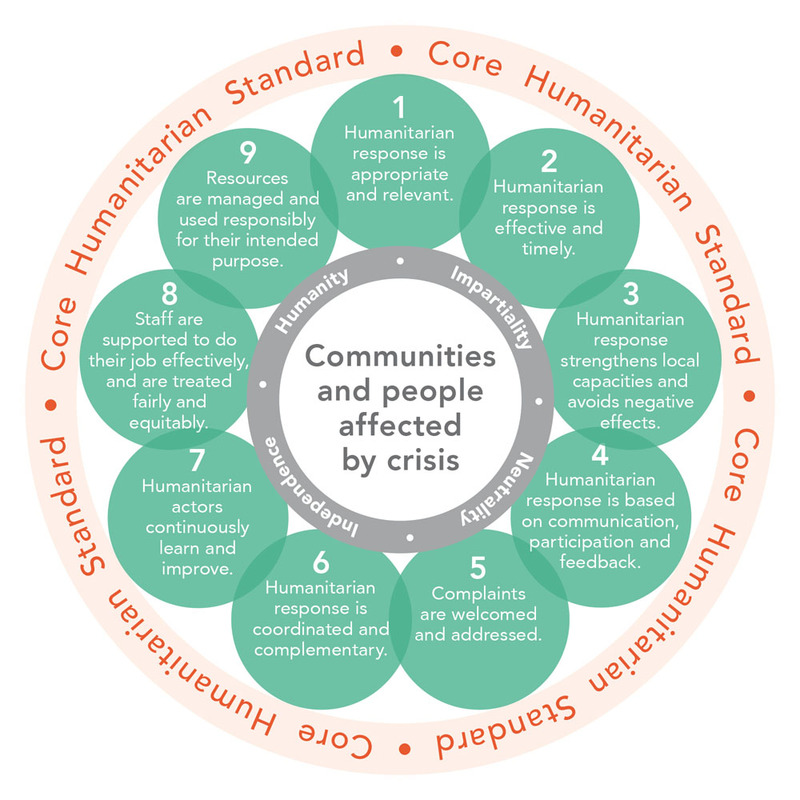 The Core Humanitarian Standard (CHS) outlines what good humanitarian action looks like for communities and people affected by crisis, and the staff and organisations involved in a response. The purpose of the CHS is to help organisations design, implement, assess, improve and recognise quality and accountability in assistance and programmes. It outlines the policies, processes, procedures and practices that an organisation needs in order to deliver quality assistance while at the same time being accountable to communities and people affected by crisis. The CHS has Nine Commitments, which together form a framework of quality and accountability good practice can be easily implemented by all humanitarian actors and in development programmes. Organisational Responsibilities to support the consistent and systematic implementation of the Key Actions throughout the organisation. The policies, processes and systems organisations engaged in humanitarian action need to have in place to ensure their staff provide high-quality, accountable humanitarian assistance. Where can I view the Core Humanitarian Standard document? The Core Humanitarian Standard can be downloaded in 22 languages. What other standards have informed the Core Humanitarian Standard? The Global Humanitarian Platform Principles of Partnership. Who approved the Core Humanitarian Standard and what organisations have endorsed it? The Core Humanitarian Standard (CHS) was approved in October 2014 by the CHS Technical Advisory Group, which comprised more than 60 members who represented a variety of humanitarian constituencies and technical expertise. In November 2014, the Boards of the Humanitarian Accountability Partnership (HAP), People In Aid and the Sphere Project (now replaced by Sphere) individually endorsed the CHS for their organisation or project use. All actors working in humanitarian assistance can publicly endorse the Core Humanitarian Standard through a public statement of support. This statement can outline how the organisation will promote and apply the CHS. Does the Core Humanitarian Standard sufficiently consider accountability to people affected by crisis, and benefit them? The Core Humanitarian Standard (CHS) helps communities and people affected by crisis in two ways. Firstly, it outlines what organisations need to do in order to be accountable, which will result in the assistance provided being more targeted, timely, and in line with what people need. Secondly, the CHS can be used by communities and people affected by crisis as a guideline for what to expect from those organisations committed to implementing the CHS. Through this, organisations can be held to account directly by the people they seek to serve. The Joint Standards Initiative (JSI) called for the inclusion of affected populations in any new standards development process. This was taken into consideration at the planning stage of the CHS. The CHS consultation and testing phase included engagement with communities and people affected by crisis. The CHS puts affected people and communities at the centre of humanitarian action and promotes respect for their fundamental rights. Additionally, the CHS is underpinned by the right to life with dignity, and the right to protection and security as set forth in international law. Ensuring that people who have grievances can safely lodge a complaint and organisations engage a mechanism to redress wrongdoing. Such mechanisms have been proved to strengthen trust between agencies and affected people and have highlighted the link between community participation and ownership and quality. How will the Core Humanitarian Standard help improve programming? The CHS outlines best practice in accountability in humanitarian contexts. By applying the CHS, agency staff will have a benchmark on how best to operate. Communities and people affected by crisis will know that they will get assistance that is best suited to their needs. Donors will be reassured that their funding is contributing to well-targeted and well-managed programmes, and governments will get a clearer idea of how humanitarian organisations plan to engage with communities in the countries in which these organisations operate. As a measurable and verifiable standard, the CHS enables all parties to be clear about what is promised, what can be expected and what has been delivered and how. Can the Core Humanitarian Standard hamper the agility of organisations in time of crisis? In the Joint Standards Initiative (JSI) consultation, a concern was raised that standards could hamper the agility and flexibility of humanitarian organisations in times of crisis. There has been no evidence to date that any of the humanitarian standards, technical or organisational, have slowed down or hampered an organisation's humanitarian response. On the contrary, the implementation of good practices as identified in the CHS should favour more effective and accountable work of organisations in all the phases of their interventions. The JSI found that 99.8% of humanitarian actors interviewed supported having standards in the sector. How does the Core Humanitarian Standard make the sector more coherent and effective? The Core Humanitarian Standard helps to ensure that the range of humanitarian actors working in the sector work in coordination with one another, bringing greater coherence to work done in often chaotic crisis situations. The CHS puts the voices of communities and people affected by crisis at the heart of decision-making, which makes the response more targeted and effective. It is anticipated that over time, the CHS will be recognised and used by the majority of humanitarian actors, including national and donor governments and all operational agencies. Applying the CHS supports better planning and allows an organisation to embed operational risk management practices into its culture, enabling improved procedures to be put in place and management to make informed decisions about where to invest in risk mitigation techniques and improved controls. Such systems are promoted by the CHS, and many organisations have noted that better planning supports a more rapid response and deployment of staff to crisis-affected areas, not the contrary. Will there be guidance to support the application of the Core Humanitarian Standard? Yes. Guidance is a critical part of the CHS process. As the CHS is a verifiable standard, it is important that all humanitarian actors have a consistent and full understanding of the Standard and how it should be applied. The CHS Guidance Notes and Indicators are a supplement to the Standard. The guidance provides clarification on the Key Actions and Organisational Responsibilities laid out in the CHS and examines some of the practical challenges that may arise when applying the CHS. It explains why each of the Nine Commitments of the CHS is important and provides some examples for different audiences and for different contexts. All guidance, tools and resources related to the CHS are developed, revised, promoted and disseminated in a collaborative, inclusive manner by the three founding bodies of teh CHS, namely CHS Alliance, Groupe URD and Sphere. Other actors in the humanitarian sector are welcome to adapt, disseminate and promote CHS resources according to their needs. What indicators will be used to assess the level of application of the Core Humanitarian Standard? The Scheme offers four verification options with different degrees of rigour and confidence in the results. These are self-assessment, peer review, independent verification and certification. Although each option is a stand-alone, the indicators used in the self-assessment are common to all four options. We encourage you to watch a short four-minute video animation that gives an overview of the benefits of verification, the CHS Verification Scheme and the four options available for verification. The animation is available in Arabic, English, French and Spanish. Can we apply the Core Humanitarian Standard to development work? Although it is primarily intended for the humanitarian sector, the CHS can also be used to bring better quality and greater accountability to development and advocacy work. An effort has been made to develop the CHS in such a way that it can also be used by dual or multi-mandated organisations. The commitments of the CHS and the related key actions reflect the key human rights principles of participation, accountability, transparency, and inclusion. As the CHS commitments promote quality and accountability they can be used by any organisation from the project and programme level up to the headquarters level. What do you expect from me, the user? We hope you will read the Core Humanitarian Standard (CHS) and apply and implement those elements relevant to your work. Where organisational processes prevent you from being as accountable as you would like, or from delivering quality assistance, we hope you will encourage change. If your organisation decides to participate in external verification of the CHS, your employer many have additional expectations with regard to the way you work on the promotion and application of, and reporting on, the CHS. What organisations should use the CHS? The CHS can therefore be promoted and implemented by all who undertake humanitarian action, as well as those involved in development. They can include individuals, organisations, coordinating bodies, consortia and other groups undertaking or contributing to humanitarian action, such as: local, national and international NGOs, the Red Cross and Red Crescent Movement, United Nations, donor agencies, national governments and the private sector, among others. It can also be promoted and implemented by collective humanitarian mechanisms such as the cluster system, humanitarian country teams, and pooled funding mechanisms. How should organisations apply the Core Humanitarian Standard? Organisations that decide to use the CHS should promote it both within their organisation and externally. Organisations formally committing to the CHS aim on all occasions to fulfil all Nine Commitments. As a minimum, they are expected to work towards continuously improving their systems, structures and practices in order to consistently improve the quality and accountability of their humanitarian responses. However, the organisations and individuals involved in humanitarian action are diverse. They need to act in a timely manner, and adapt their actions to the capacities and mandate of their organisations, as well as the phase and circumstances of the crisis in which they find themselves. In circumstances when organisations encounter difficulties fulfilling the Nine Commitments, they should acknowledge this and consider how to address in the future the issues preventing them from doing so. Any analysis of the application of the CHS should be based on the degree to which any given organisation is working to achieve the Nine Commitments and not simply on whether key actions have been implemented and/or organisational responsibilities discharged. How can organisations working with partners benefit from the Core Humanitarian Standard? Many national and international NGOs and UN agencies work with partners. All operational organisations should apply the CHS in their work. Organisations working with partners should advocate for its use by their partners and encourage uptake in all aspects of humanitarian action. Partners should also be actively enabled and supported to apply, monitor and report on the use of the CHS. How can I provide feedback on the Core Humanitarian Standard? The Core Humanitarian Standard (CHS) is the result of a global consultation process during which humanitarian workers, communities and people affected by crisis, several hundred NGOs and networks, governments, United Nations and donor agencies, and academics rigorously analysed the content of the CHS and tested it at headquarters and field level. The CHS will have a mechanism in place to receive constant feedback on the applicability of the Standard and any challenges that organisations have in relation to its implementation. Comments on the CHS are therefore welcome at any time, and can be sent, along with enquiries, to info@corehumanitarianstandard.org or through the Contact Us form. When will the Core Humanitarian Standard be reviewed and revised? The CHS will undergo regular formal revisions in alignment with international good practice. The usual lifespan of a standard is five years and therefore the CHS will undergo a formal revision at the latest by the end of 2019. The exact timing of the revision will be determined by the Steering Committee, an executive body composed of representatives of the CHS Alliance, Groupe URD and Sphere, the three founding bodies and copyright holders of the CHS. In between revisions, significant comments or learning from practice may be addressed either by updating existing guidance on the CHS or by issuing specific guidance notes relevant to the topic in question. This allows for a faster and more flexible response to issues than only through formal revisions of the standard. How can I participate in the review and revision process of the Core Humanitarian Standard? All users of the Core Humanitarian Standard will be actively invited to make their opinions known within the framework of the formal CHS consultation process. Similar to the approach taken during the development of the CHS, the revision process will result from a wide consultation process, during which technical committees made up of standards experts will be assembled. The CHS Steering Committee will determine the most appropriate revision process based on feedback received and in line with best practice. As noted earlier, your feedback on the CHS can also be addressed in a much faster and more flexible way through its inclusion in the CHS guidance: it is expected that the guidance will be updated regularly and will be able to adapt to challenges and solutions of applying the CHS as such advice evolves. There will be a mechanism to feedback after the launch of the final version of the CHS Guidance Notes and Indicators. Is certification against the Core Humanitarian Standard mandatory? No. The CHS remains a voluntary standard and certification will not be mandatory. The CHS Verification Scheme allows organisations to measure the extent to which they have successfully applied the CHS requirements, and allows them, if they so wish, to demonstrate that they have done so. How does the Core Humanitarian Standard relate to the Sphere Core Standards? The overall intent of the CHS and the Core Standards is largely the same: communities and people affected by crisis are placed at the centre of humanitarian action and if the standards are applied in practice, they will improve the quality and effectiveness of the assistance provided and facilitate greater accountability to communities and people. Within the framework of the currently on-going revision of the Sphere Handbook the Core Humanitarian Standard will replace the six Core Standards (CS). However, the CHS will not modify or replace Sphere’s Humanitarian Charter, Protection Principles or the minimum standards in the following fields: water supply, sanitation and hygiene promotion; food security and nutrition; shelter, settlement and non-food items; health action). How does the Core Humanitarian Standard relate to the Quality and Accountability COMPASS? A set of guidelines for using the Core Humanitarian Standard to prepare/conduct an evaluation and establish a quality & accountability system. How does the Core Humanitarian Standard relate to the Humanitarian Quality Assurance Initiative (HQAI)? The Humanitarian Quality Assurance Initiative (HQAI) was established in 2015 as a mechanism for independent quality assurance of humanitarian action. It provides independent verification against not only the CHS but also against other standards, commitments and recognised good practices. Download resources to support the promotion and implementation of the CHS in your organisation. The Core Humanitarian Standard, rooted in the needs and rights of the communities and people affected by crisis and founded in humanitarian principles, will inspire energy and action for improved quality and accountability.